In the August 26th edition of the TheHumanist.com, author Brody Armstrong brings up some interesting points about a current topic usually at, or near the top of everyone’s “Most Concerned About” list when pollsters send out its routine queries under that heading: health care. What differentiates Armstrong’s short analysis is the role social media, specifically the way the fundraising-for-profit GoFundMe app and others like it have worked themselves into the conversation about the current healthcare crisis. “Why GoFundMe Isn’t the Solution for an Underinsured America” shows how this form of charitable giving to people with serious or even catastrophic injuries or illnesses—while (in some minds) is an ethical requirement aspiring to a positive moral good—has its shortcomings. GoFundMe often boasts of huge goal-busting campaigns, but some cases go without a single dollar donated, and many more close woefully under-supported. From this, Armstrong surmises that the only way to ensure everyone’s medical needs are met is through a national single-payer, Medicare-for-all styled universal coverage. 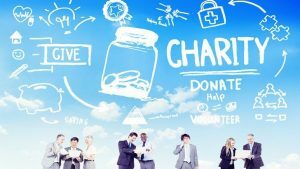 Reliable, steady streams of funding is an inherent problem with all charitable organizations, as well as a host of other problems from administrative to the philosophical. From that, we are led to questions about any charitable or philanthropic endeavor. Do they really help in “the big picture” of solving, or at least alleviating their focus issues, or are they just band aid fixes? Are they nothing more psychological salve for feelings of pity or guilt rather than rational decisions to assist made after recognizing a special social ill? Are acts of benevolence defeating their own purpose by fecklessly chasing symptoms rather than investigating and evaluating root causes and dedicating efforts to eradicate them? The administration of, and personal influence on charitable organizations has also been the subject of scrutiny by naysayers. “How much is of my money is actually going toward….”(what I thought it was going for, or somewhere else)? And how much is going toward the organization of the charity (and church!) itself, which is running it? This has been such a concern that a cottage industry of watchdog groups like Charity Navigator has been hatched. And what of those who use part of their fortunes to “influence” decisions about how their and others’ contributions are to be dispersed; or how generous contributions to Harvard University, for example, by Charles Kushner, father of Jared Kushner (White House employee and famous son-in-law) landed the very average student Jared a seat in the freshman class there. Of course, no one said Harvard U. is a charity, but…you get the idea. Or the case where the donor simply (and innocently) gives to the cause that interests or concerns her the most, rather than where her generosity has proven to be more urgently needed elsewhere. None of these “sore spots” of charity should, or likely will, be taken as disincentives to donating time, money, or material to charities; it is meant to show the bumps and blemishes in the system—and even paradoxes that lie at the foundation of the principle. With a large source of private contributions in decline (the church), as well as unpredictable downturns in the the economy, NOSHA needs to keep and expand its efforts to fill in the gaps in its modest way to the betterment of our fellow humans. But a dire outlook from the reality of today’s economic numbers shows that 40 years of stagnant wages of the middle class, along with the increasing wealth (and concomitant political power) into fewer hands, legislating smaller tax liabilities for themselves results in an eroding tax base and “austerity economics,” where social services will be cut, likely resulting in a return to Rubinow’s nightmare of the merciless Four Horsemen riding roughshod over the dignity of basic human needs; and the modest but heartfelt gifts of private individuals and humanist and benevolent organizations like ours will be but drops in the bucket. Armstrong’s analysis of the futility of GoFundMe is correct, but needs to be expanded to apply across the board to the principle of altruistic giving. The well-being of each is the responsibility of all.